Counting Crows is an American rock band originating from Berkeley, California , formed in 1991. The group gained popularity in 1994 following the release of its debut album, August and Everything After, which featured the hit single "Mr. Jones". The band's influences include Van Morrison, R.E.M., Mike & The Mechanics, Nirvana, Bob Dylan, and The Band. They received a 2004 Academy Award nomination for the song "Accidentally in Love", which was included in the film Shrek 2. According to the official band website, Counting Crows has sold over 20 million records worldwide. Singer Adam Duritz (former member of the Bay Area band The Himalayans) and guitarist Dave Bryson formed Counting Crows in San Francisco in 1991. In addition to his experience in The Himalayans, Duritz had contributed to recordings by the Bay Area group Sordid Humor ("Barbarossa"), though he was never a member. Counting Crows began as an acoustic duo, playing gigs in and around Berkeley and San Francisco. Another friend, guitarist David Immerglück, played with them from time to time, though he was not an official member of the group, experimenting with other musicians in the area. As the emerging band recorded some demos, and later, as other musicians joined the duo to make a full band, Immerglück recorded with the others on some of the songs on their first album. He declined joining the band at the time, because of his membership in two other locally popular bands; Monks of Doom and Camper Van Beethoven. By 1993, the band had grown to a stable lineup of Duritz as vocalist, occasional pianist, and primary songwriter, Bryson on guitar, Matt Malley playing bass guitar, Charlie Gillingham on keyboard, and Steve Bowman, as drummer, and the band was a regular in the Bay Area scene. The same year, the band signed to Geffen Records. January 16, 1993, the band, still relatively unknown, filled in for Van Morrison at the Rock & Roll Hall of Fame ceremony, and was introduced by an enthusiastic Robbie Robertson. At the ceremony, they played a cover of Van Morrison's "Caravan". Before signing to Geffen, the band recorded demo versions of a number of songs, known as the 'Flying Demos'. These later surfaced among the Counting Crows fanbase. Tracks include "Rain King", "Omaha", "Anna Begins", "Einstein on the Beach ", "Shallow Days", "Love and Addiction", "Mr. Jones", "Round Here", "40 Years", "Margery Dreams of Horses", "Bulldog", "Lightning", and "We're Only Love". Some songs from the tape later resurfaced (in reworked versions) on the band's debut album August and Everything After. The band took its name from a divination rhyme about the crow, heard by Duritz in the film Signs of Life. The rhyme begins the third verse (around the 2:07 mark) of the song "A Murder of One" on the album August and Everything After : "Well I dreamt I saw you walking up a hillside in the snow / Casting shadows on the winter sky as you stood there, counting crows / One for sorrow, two for joy / Three for girls and four for boys / Five for silver, six for gold / Seven for a secret never to be told." In the poem, the act of counting crows is particularly useless. This recalls a traditional rhyme: "One crow means sorrow, two crows mean joy, three crows a wedding, four crows a boy, five crows mean silver, six crows mean gold, seven crows a secret that's never been told." In the United Kingdom , the rhyme is well known but uses magpies rather than crows. A popular superstition is that if one sees a single magpie, one should greet it to deflect the "sorrow". From the beginning, Counting Crows focused on live performances. The band's debut album August and Everything After, produced by T-Bone Burnett, was released in late 1993. 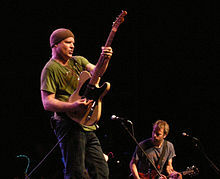 The band toured extensively in 1993 and 1994, both as headliners and in supporting roles with other artists, including Cracker, the Cranberries, Suede, Bob Dylan, Los Lobos, Jellyfish, and Midnight Oil. The first single, "Mr. Jones," refers to The Himalayans bassist, who was Duritz's childhood friend; Marty Jones and Kenney Dale Johnson, the drummer of Silvertone, Chris Isaak's band, describing the desire of working musicians to make it big and the fantasies they entertain about what this might bring. Duritz sang the song in fun, enjoying the fantasy of making it big. However, he didn't realize that just months later, in December 1993, MTV began playing the video for the song. It was an unexpected hit song, drawing massive radio play and launching the band into stardom. August and Everything After became the fastest-selling album since Nirvana's Nevermind. With the turbo charge of their first single propelling the band forward, and positive reviews from Rolling Stone Magazine and other publications, it was decided that the band could use another guitarist, and Dan Vickrey, another Bay Area musician was offered the role as lead guitarist, singing backing vocals. The harmonies within the band drew praise from the start. In 1994 the band appeared on Saturday Night Live and Late Show with David Letterman, and toured with The Rolling Stones. The album sold 7 million copies, but success took a toll on the band; drummer Steve Bowman left, and Duritz suffered a widely-reported nervous breakdown, which was not his first. The band played only two gigs in 1995. This allowed Duritz to write a set of songs that became the band's second album, Recovering the Satellites. Released October 15, 1996, it was heavier than August and Everything After, perhaps due to the addition of second guitarist Dan Vickrey, who had joined in early 1994. A response to the sudden fame that "Mr. Jones" had brought, it contains lyrics such as "These days I feel like I'm fading away / Like sometimes when I hear myself on the radio" (from "Have You Seen Me Lately?") and "Gonna get back to basics / Guess I'll start it up again" (from "Recovering the Satellites"). Dealing with the theme of Duritz's unease with his newfound fame, the album was described as "a concept album of sorts about trying to pick up the pieces of a family, a social life and a psyche shattered by fame." In July 1997, after nine months of near-constant touring in support of the album, Duritz developed nodules on his vocal cords, leading to the cancellation of a number of gigs. After taking time off to recover, the band toured for the rest of 1997, concluding with a show at the Hammerstein Ballroom , New York . This concert was released as half of a double live album Across a Wire: Live in New York City. The other disc was a recording of an acoustic set from the band's appearance on the VH1 Storytellers show. In 1999, Counting Crows released This Desert Life, sales of which were propelled by the success of "Hanginaround" and "Colorblind" which was also featured in the movie Cruel Intentions. Supporting the album, the band embarked on a co-headlining tour with alternative rock band Live. Counting Crows closed nearly every show. Frequently, Duritz joined the stage for Live's performance of "The Dolphin's Cry," and Live's Ed Kowalczyk sang a verse of "Hanginaround" with the Counting Crows. Before this album and subsequent tour, the band invited session player and long-time friend David Immerglück to join the band as a permanent member. Immerglück had played on every Counting Crows album as a sideman, but early on had declined a permanent position with multiple other musical commitments that had previously prevented him from joining the band full-time. This time, however, "Immy" as Immerglück is known to other bandmates, joined as a full member. He plays a variety of instruments with the band, including acoustic, electric, and pedal steel guitars, slide guitar, and mandolin, as well as contributing backing vocals. On July 9, 2002, the band released their fourth studio album, Hard Candy. The album included a cover of Joni Mitchell's song "Big Yellow Taxi." Vanessa Carlton contributed backing vocals to the single edit of the track, which appeared on the soundtrack for Two Weeks Notice and was re-released on future Hard Candy albums. The original version, without vocals by Carlton, appeared on the first album release as a hidden track. Hard Candy received better reviews than the previous efforts, with "radio friendly" songs, like "American Girls", and contains a more upbeat feel and tempo. The band toured with the Dutch band, Bløf, and together, a song, "Holiday in Spain" came together as a result of the cameraderie between the two groups. It is sung partly as a dual language duet, and partly as a musical "round", with both lead singers singing in differing languages at the end of the song. Midway through the Hard Candy tour, drummer Ben Mize (born February 2, 1971, Durham , North Carolina ) amicably left the band to spend more time with his family and pursue his own musical interests. After Mize completed the American leg of the tour, he was replaced by Jim Bogios, formerly a drummer with Ben Folds and Sheryl Crow. In November 2003, Counting Crows released the greatest hits album, Films About Ghosts. (The title is taken from the lyrics of "Mrs. Potter's Lullaby," which appeared on This Desert Life.) The band also toured in 2003 with John Mayer, Maroon 5, and the Graham Colton Band. In 2004, the band's "Accidentally in Love" appeared on the soundtrack of the hugely popular computer-animated film Shrek 2. The song was nominated and performed for an Academy Award, and later versions of the 2003 greatest hits album include the track, which was re-released in 2004. Following the Hard Candy tour, longtime bassist Matt Malley left the band. He was replaced by Millard Powers, who played with Crows drummer Jim Bogios on Ben Folds' Rockin' The Suburbs tour. Duritz hinted in an interview that Counting Crows' next studio record would be released in late 2007. He indicated that the band recently had spent three weeks working in a recording studio with Gil Norton, the producer behind Recovering the Satellites. On September 27, 2007, Duritz announced on his blog that the band had asked its record label to postpone the album's release until early 2008, citing the time pressures involved in preparing both the new album and an August and Everything After deluxe edition for release. Duritz revealed the working title of the album to be Saturday Nights & Sunday Mornings, explaining, "Saturday night is when you sin and Sunday is when you regret. Sinning is often done very loudly, angrily, bitterly, violently." Vickrey has stated that "the idea at the moment is to have kind of a rocking side and then an acoustic-y, maybe country-ish side. We got the first half done in May in New York, so half of it is pretty strong and done. And now we're going to work on the second half, the country tunes, during the tour." On July 22, 2007, at Daniel S. Frawley Stadium in Wilmington, Delaware , a new song was previewed at the concert, titled "Washington Square"; an acoustic ballad that is the first track which turned up on the latter half ("Sunday Mornings") of the new record. Also played was "Cowboys," a track from the first half ("Saturday Nights") of the new album. "Insignificant" was stated by Duritz to be the second track on the "Saturday Nights" portion of the album. On August 8, 2007, VH1 filmed a live performance of "Mr. Jones". Clips of that performance were shown on the VH1 miniseries 100 Greatest Songs of the 90s. VH1 ranked "Mr. Jones" at #27 on the list. On September 18, 2007, Counting Crows played a show at Town Hall in New York City, during which they played August and Everything After from beginning to end. They also played several songs from Saturday Nights & Sunday Mornings. This show was recorded for an upcoming DVD release. The album was released on March 25, 2008. On January 16, 2008, the band released a digital single on their official website as a free download. It features "1492" from the "Saturday Nights" half of the disc and "When I Dream Of Michelangelo" from the "Sunday Mornings" half as its B-side. The lead single "You Can't Count on Me", a track from the "Sunday Mornings" half of the record, was released on February 5, 2008. The band's former bassist, Matt Malley, played the bass guitar on the track "Sundays". Former drummer Ben Mize played drums on the tracks "Los Angeles" and "Sundays". iTunes Live from SoHo was recorded on March 27, 2008 at an in-store performance in the SoHo Apple Store in New York City . The album was an iTunes exclusive. It featured many songs from the band's 2008 release Saturday Nights and Sunday Mornings along with old favorites such as "Rain King" and "Long December." On the March 22, 2009, Duritz announced on the band's website that the band would be leaving Geffen Records, with whom they had worked for 18 years. On this day and a few weeks later, a message from Duritz himself was posted on the band's homepage. He ended the letter with a free download to the band's cover of Madonna's "Borderline." The track was recorded live at the Royal Albert Hall in 2003. Most songs have been altered at some point during the band's history; the ones most often subjected to this treatment include "Round Here", "Goodnight Elisabeth", "Rain King", and "A Murder of One". Examples of this can be heard on the MTV Live at the 10 Spot disc from Across a Wire: Live in New York City (on which "Round Here" contains lyrics from "Have You Seen Me Lately?") and the VH1 Storytellers disc ("Anna Begins" has an extended mid-section with new lyrics, and the introduction to "Mr. Jones" includes lyrics from "Miller's Angels" and from The Byrds' "So You Wanna Be A Rock & Roll Star"). Fansites have attempted to keep records of these alternate lyrics, or "alts". The band has drawn deep in covering artists such as Rod Stewart, Fairport Convention, Pure Prairie League, The Rolling Stones, Jackson C. Frank, Bob Dylan, Jackson Browne, Grateful Dead, Joni Mitchell, Bruce Springsteen, U2, and Oasis.The band has also become known for its acoustic performances, most notably recorded on the VH1 Storytellers disc from Across a Wire: Live in New York City. The band decided that it would not play any songs at the Storytellers concert for which it did not have substantially different acoustic arrangements. They have since performed variations of these acoustic arrangements at a number of concerts, often opening with a few acoustic numbers before launching into an electric set. On August 1, 2008 the band launched a new website, offering band-approved, soundboard-quality recordings of its concerts. The band actively encourages the recording of its concerts and the distribution of the resulting bootleg recordings. The band hosts a trading network on its website to enable fans to swap concert recordings. Sale of fan recordings for profit is prohibited; fans must either trade bootlegs for other bootlegs or pay for blank media, postage, and packaging. An unofficial torrent site named Crowstown, offers a vast quantity of video and audio bootlegs for free. Clueless (1995): "The Ghost In You"
Rounders (1998): "Baby, I'm A Big Star Now"
VH1 Storytellers - Compilation Album (2000): "Rain King"
Mr. Deeds (2002): "Goin' Down to New York Town"
Two Weeks Notice (2002): "Big Yellow Taxi"
Boy Meets World character Shawn Hunter is mentioned as a Counting Crows fan. The song "Raining in Baltimore" is featured on the soundtrack of "The Last of the Watermen" episode of Homicide: Life on the Street. The song "Walkaways" is featured in an episode of the FOX series Party of Five. Songs by Counting Crows were played during television drama series such as Cold Case (several songs by the band have been used, such as "Anna Begins" and "Recovering the Satellites") and the following: Boston Public (the band made a personal cameo as "the band in bar"), Brothers & Sisters, Dawson's Creek , The Days, Everwood, E.R., Laguna Beach , One Tree Hill, Party Of Five, Roswell, Felicity (twice), and Scrubs. Counting Crows were featured on ESPN2's Cold Pizza and interviewed by PBS's Tavis Smiley in 2004. At the end of an episode of Family Guy Peter thanks the Counting Crows doing a parody of an SNL ending. Counting Crows performed live before the 2007 MLB All-Star Game. In 2008, Counting Crows performed on The View and Good Morning America in March, A&E Private Sessions, The Late Late Show with Craig Ferguson, and The Late Show with David Letterman in April (all for the promotion of their new release "Saturday Nights & Sunday Mornings"), and again on Good Morning America in May, this time from a live concert in Bryant Park . On March 27, 2008, Counting Crows performed live on The Howard Stern Show. They played "Round Here", "Washington Square" and "Rain King", using Bruce Springsteen's "Thunder Road" as an alternative bridge to the last song. "When I Dream of Michelangelo" was played at the end of an episode of ABC's Brothers & Sisters on April 27, 2008. The name of progressive metal band Between the Buried and Me is derived from the lyrics in Counting Crows' song "Ghost Train": "Took the cannonball down to the ocean/Across the desert from the sea to shining sea/I rode a ladder that climbed across the nation/Fifty million feet of earth between the buried and me." In 2004, Victory Records released a tribute album to the Counting Crows entitled "Dead and Dreaming". The records consists of various bands performing covers of the Counting Crows. The Counting Crows song "Anna Begins" served as the title of a 2008 Young Adult novel, and appears late in the book.